A series of 9 meter tall columns holds a series of 6 Cold Cathode Florescent Lights encased in acrylic cylinders which form a matrix of 36 individually controllable lighting elements. Additionally, three wirelessly controlled CCFL’s are mounted into pedestals which are carried around the stage by the performers and function as sacred objects in the work’s dramaturgical structure. The stage scenographic environment consists of the lighting system in front of which is suspended a large scale, semi translucent projection screen upon which is projected a series of five iconic yet, visually abstract textures. 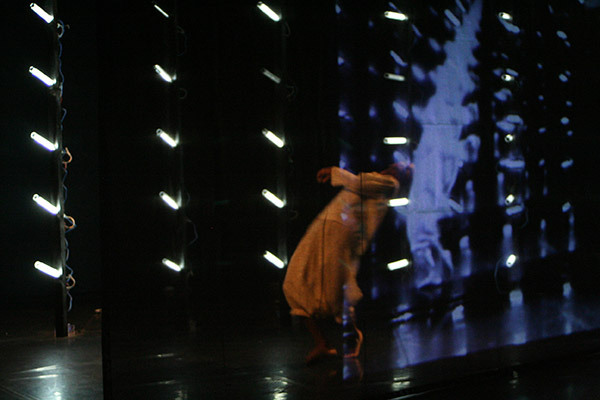 Top and side cameras analyze the flow of motion from the dancers and are used to provide simultaneous input to both the lighting and projection systems. 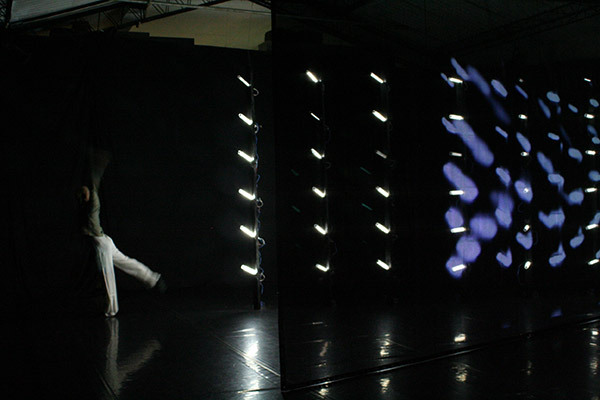 The lighting responds to the performers’ motion by either triggering set patterns, directly coupling with the dancers or creating abstract traces based on different rhythmic and temporal patterns. The lighting scenography is inspired by both the abstract images of bodily gestures that are prevalent in traditional Indian dance forms such as Bharatnatyam as well as by the ubiquitous appearance of florescent lighting fixtures in everyday life in India.